I'm looking for some bullet proof steering suggestions for jumping up to around 6 inches of lift. What are some of your set ups. I'd like to know details, angles every part you have, what the easiest most cost effective solutions are and what the more complex solutions might be.. Keep in mind I have a budget of around $500 for steering. I currently have zone's 4.5 lift with add a leafs. Kit involves 3" lift add a leaf with a 1.5" shackle. Planning on installing RE 4.5" full springs to net around 6" in the rear. I have a rock hard tire carrier so it should sit around 5.5/6". Up front I have zones 4.5" coils, will be installing acos adjustable coil spacers to get 1.5-2 inches. Also will be running Iron rocks rock link long arm kit. Considering the clayton LA kit too, but feel a 3 link might be better than radius arms. Heres the jeep on a fresh set of 35" km2's! Off Road only U-Turn steering, or the WJ knuckles steering and brake upgrade. Which are you trying to upgrade, the mechanical parts or the hydraulic parts? Thanks for the reply. Both of those are a little over my budget. for the price Id definitely go for the WJ upgrade.Been putting some serious thought in the WJ swap, just seems a little complicated and pricey. Right now just looking to upgrade the mechanical parts. Hydraulic parts will come later. Probably run a durango box. I've been running a factory stock steering for 17yrs at 6" lift. I finally broke down last year and bought the Currie Correct-link. No change in the way it drives, just more confidence in the fact it's "Alot" beefier! I will add that I'm running the WJ knuckles/brakes but I wasn't going to mess with making that style steering/trackbar to what already was a perfect set-up! I am at about 5" lift, I did WJ swap last year, its pretty straight forward. 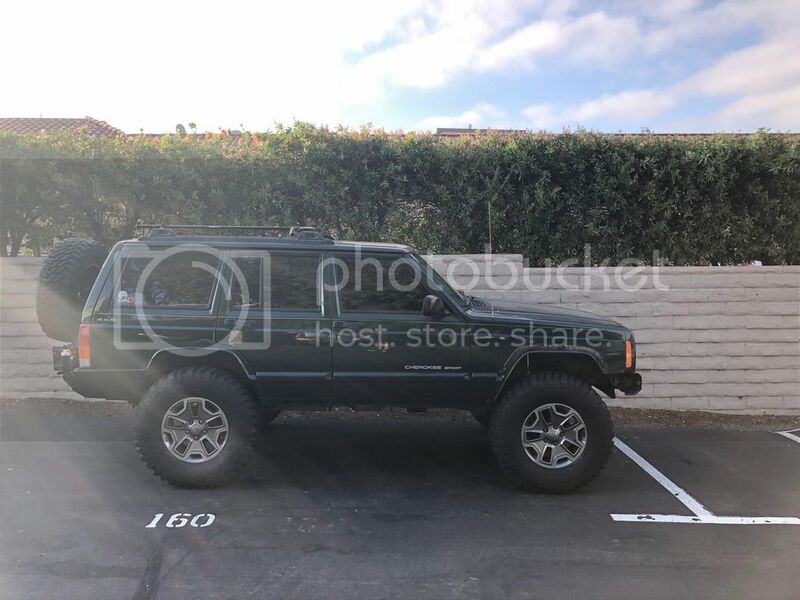 Besides the brakes, it gives you two arms on the pass knuckle, so you can get rid of the inverted Y. I went with 1 ton ends, but some guys keep the WJ TREs which are still larger than the XJ stuff to save money. I had Boostwerks send me the pieces he used to make his frame side trackbar bracket. of all the ones I could find, it outboarded the mounting point the most, given me the longest TB I could, short of putting the axle side on the knuckle, which would have required moving the coil buckets (which someone on naxja did do). By lowering the frameside TB mount, and raising the axle size, I got *pretty* close to parallel with my draglink. I could get a raised pitman arm, but its close enough I haven't noticed any bumpsteer. If you get a longer frameside TB mount, you WILL want to brace it to the opposite frame rail similar to RE. That extra leverage loosened up some of my bolts and I ended up with horrible death wobble. I'm currently in the process of fixing that. I spent about $1000 on my WJ swap, but I had new rotors, new calipers/pads, ruffstuff 1 ton steering, JKS OTA trackbar mount, and the Boostwerks frame side. You can probably do it for a good bit less than that. Anything going over the knuckle will need adjustment to the track bar angle. Haven't seen much in the way of reviews on it. WJ swap will be best overall but most expensive. At $500 I'd go solid tie rod and stock with the rest. Still ahve enought $ to get a new track bar and some other gooides. Currie makes a decent system but it's $$. Really considering the currie set up. Only concern is its advertised for a 4" lift. Would this be okay at lifts above 4? 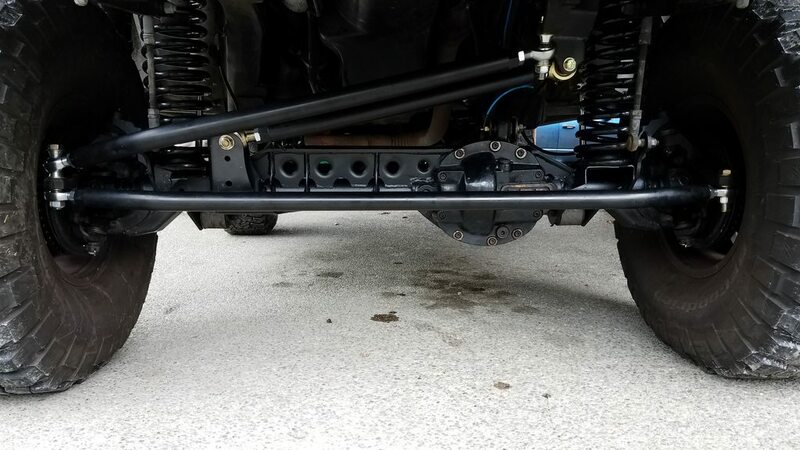 would the steering angles too steep to run 6" of lift? CavFab steering here; it's 1.5" solid bar instead of DOM. I'm somewhere between 6" ~ 6.5" of lift in the front and maybe 15 degrees on the angles. I'm at 6" lift and all the angles are perfect w/ no bump steer. Like I said it rides/drives like a Cadillac!